Some of you may recognize me. I am 4-LAN and I have been posting book reviews up on this site for a couple of years now. Today, I would like to do something a little different. I am starting this new forum because I thought many of you would be very interested in how one of our fellow TBMN members and indie author, Ken Magee, was able to achieve some pretty notable success. So, please, have a read of my interview with Mr. Magee and then feel free to post your own comments and questions. I am hoping that this interview will turn into a lively discussion that will benefit all of the members of The Book Marketing Network. Okay, so without further ado, here is my interview with Ken Magee, author of the fantasy novel Dark Tidings. Q) Ken, you have had a lot of success over at Wattpad-over half a million reads now. Can you please share with us how this came to be? It’s taken a while to rack up the reads, but I must say, I'm delighted that so many people have taken a look at Dark Tidings. How did it come about? Well, in my view Wattpad is the same as any other platform in that you get back what you put in. Here are a few of the things I did which I think paid off. Write a great book ( ) and make sure it has an intriguing blurb. There's no way a bad book is going to become well read. Each chapter needs to be reasonably error free and it needs to leave the reader wanting to move on and read more. I know that’s stating the obvious, but it needs to be said. Lots of reads will only come when lots of your readers follow the story through to the end. Publish regularly – I posted a chapter every three to four days. This meant there was constant activity which helped the rankings. If you can get onto the first page or two of your genre, you will generate a lot of new readers. I think my best ranking was #8 in Fantasy. Read and comment on other stories in your genre – not just comments like ‘nice story’ or ‘interesting idea’. I tried to make my comments meaningful, constructive and encouraging. I always voted for chapters I liked. Commenting like this brings you to the attention of the author and the readers of their story, so it’s a double-whammy. As an aside, I found some great stories which I enjoyed immensely. Respond to every comment your readers leave. Where possible I tried to engage with the reader, so my responses tended to be more than just a thank-you. Participated in a number of relevant forums. I found this difficult because there are a lot of people there who aren't particularly interested in reading or writing. Their interest is in building up followers as if the higher the number, the better they are. The danger is you can get sucked into threads which are going nowhere, but they can waste an enormous amount of time. Try and become a FEATURED book. Because of my engagement with Wattpad, I was offered the opportunity to have my Dark Tidings featured. Obviously I jumped at the chance and that meant my story was highlighted in the places where members are searching for what to read next. It was during this featured period when I hit my highest place in the rankings. Join relevant groups. One, which is no longer there, listed three books a fortnight for members to read and critique the first few chapters. I read a lot of other people’s work and made a number of ‘friends’ who subsequently did shout-outs for Dark Tidings. It comes back to engagement. I’ll stop there, but I hope you get the picture. I had to put time in to get the visibility, because as far as I know, there’s no short-cut to getting noticed. Q) How has this popularity on Wattpad interpreted into your success with Dark Tidings on other sites? One of the reasons I joined Wattpad was to get feedback on my writing and I got plenty. This allowed me to dramatically improve my books – specifically Dark Tidings, but also my style improved for the other books in the series. This is bound to have a long term effect on the success of the trilogy. In terms reviews, I've had four or five which are from Wattpad readers. As far as sales are concerned, I reckon maybe 40+ readers went on to purchase book #2 (and some #3 as well). It’s not big numbers by any stretch of the imagination, but every little helps. It’s all part of the game, and hopefully some of those readers will generate further sales through word-of-mouth. Q) I originally found you on Indies Unlimited. I believe Dark Tidings was featured on their Thrifty Thursday list. Do you know how many book sales you get from advertising here? Will Dark Tidings be featured again on Indies Unlimited? I have no idea how many people have noticed me on Thrifty Thursday! I believe that’s where you found Dark Tidings, so I guess the real answer is at least one. I do post there regularly, so hopefully I'm not wasting my time. Q) Dark Tidings is not the usual type of fantasy story one might expect. Can you please share with us how the story came to be? What inspired you? I worked in the computer industry for many years so I was always interested in technology and the Internet. As far as leisure was concerned, funny fantasy was always my passion. It seemed natural to me to push all those things together… the Internet, ancient magic and humour. I think it works really well (I would say that, wouldn't I? ), and it was a lot of fun to write, I literally laughed out loud time and time again because the characters kept coming up with funnies which I’d never heard before. As far as inspiration is concerned, I think I have to thank the late Terry Pratchett. It was his first Discworld novel, The Colour of Magic, which gave me the burning desire to write a fantasy with wizards, magic and adventure, I just wish I had finished Dark Tidings sooner… before JK Rowling stole my limelight! Q) You have sequels to Dark Tidings out now. Without giving out any spoilers, can you please give us a brief glimpse into these? All I'm going to say is that each sequel continues from exactly where the previous book leaves off. This means if you’re a binge reader, you could settle down with all three books and blast through a thousand pages of fun and adventure. Q) Finally, from my time here on The Book Marketing Network, I have gathered that most of the members on this site are indie authors, such as yourself. As an author who has managed to get so many to read his work, would you be so kind as to offer some advice to those who are struggling to achieve this goal? I think you have to put the time in and engage. It’s not about ramming the ‘buy my book’ message down everyone’s throat, it’s about meeting people and taking an interest. This interview is a perfect example, I've enjoyed doing it and I hope some people get one or two useful pieces of information from it. I'm not expecting anyone to rush out and buy my book(s), but mind you, it would be nice if one or two did. And finally, thanks to 4-LAN for the opportunity to share. Thank you so much for your time, Ken. I am sure that I am speaking for many others on The Book Marketing Network when I say that we wholeheartedly appreciate you taking the time to do this interview and for sharing your success story with us all. Okay, well, that was a heck of a lot of fun! And, marks my first author interview, by the way. Are you on Wattpad, Marilyn? I'd love to check out your writing if you are. Great information. Thank you both. I've only just discovered Wattpad, so this is particularly helpful. Thank you, E.G. 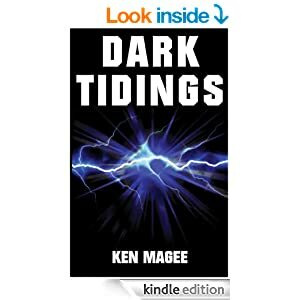 I had picked up Ken's book from the Thrifty Thursdays they have over at Indies Unlimited, not knowing that Dark Tidings was available for free on Wattpad! When I started uploading Blood and Fire on Wattpad, I came across Dark Tidings as I was perusing the books in the fantasy genre. If you have any specific questions, please let me know and I'll answer them if I can. How do I make extracts from my book available to users - here or on Wattpad? As for Wattpad-you merely just join the site and then you can start uploading your work there. Mind you, Wattpad is a free site, so put up as much or as little of your books as you like. I joined at Wattpad but can't see how to upload my book there. The only option I can find is "Create a Story". Their help said you can put your book up chapter by chapter as you write it, but unfortunately I don't work like that. I've no idea what will go where when I start writing. I just have a scene in my head, write it, and then see where it goes or where it fits. (Elgar used to write his music in the same way, so I feel I'm in good company). Good luck with your adventure. What's your Wattpad link? Fantastic story. I'm going to share it on my blog at http://www.bookmarketingbestsellers.com. Thanks for sharing it. Thanks John. Wattpad is an interesting place - it is one of the few places where a writer can get genuine feedback on their writing.